'Supreme Court is no longer a branch of Meretz, democracy has only grown stronger.' Shaked sends clear message to Right ahead of elections. "The Supreme Court is no longer a Meretz branch. In the past, there were sectors that felt the Supreme Court didn't represent them - today it represents everyone. 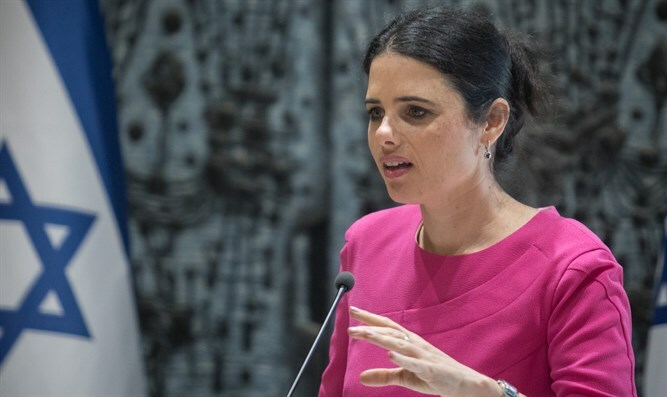 It's more diverse, more conservative; the only thing missing is a haredi Supreme Court justice," Justice Minister Ayelet Shaked said in a comprehensive interview with Yediot Ahronot. "My aspiration," says Shaked, "was to divert the ship from the direction that Aharon Barak was leading it, in the conservative direction. In judges' selection I managed to do it. Before the elections, we called for a change in the policy of the courts - I can apply this requirement thanks to my high political abilities." During Shaked's term 300 judges were advanced and appointed, about a third of all judges in the country. "I didn't count how religious and how secular they were," she says. "I read their judgments and their opinions, and I consulted with those who know them, and the most important thing is the identity of the justices, I promoted people who in their worldview are more conservative," she said. "Democracy under my watch hasn't weakened, it's only strengthened. "When Yitzhak Shamir went to the Madrid conference to recognize Palestinian autonomy, Netanyahu declared he supported establishing a Palestinian state, and that was when the Likud had 40 seats. It led to the disengagement and evacuated settlements in Gaza and northern Samaria. I hope the public understands that if Jewish Home doesn't receive a number of Knesset seats, Netanyahu will form a coalition with the Left." The Minister also attacked the New Israel Fund as "a body whose activities undermine the State of Israel as a Jewish and democratic state. The associations benefiting from the Fund's monies operate judicial warfare against the State of Israel and act against it abroad."